Ricola, the expert in Swiss Herb confectionery, is adding to it travel retail exclusive 75g tin range at TFWA World Exhibition this October (Mediterranean Village, Booth N9) with a new Alpine Fresh variation. One of Ricola’s most popular choices globally, this mint flavoured version joins the existing offer of Original Herb, Lemon Mint and Cranberry sugar-free herb drops designed specifically as a checkout item for impulse sales. “Based on the initial success of our 75g tins in Travel Retail and demand from consumers for more choice, we saw the opportunity to extend the offer available,” explains Ricola Head of Travel Retail and Middle East, Andreas Reckart. “The uptake by consumers has been excellent so far and we’re sure this additional flavour will sell equally well.” Additionally, Ricola will be rolling out a range of four 200g tins, each with a different typically Swiss retro-design, to global travel retail markets in Cannes. Initially listed exclusively through Swiss airports with Dufry, demand has been so high that the line is now being made available to retailers worldwide. Containing an assortment of sugar-free herb drops, the tins have already been listed with King Power Thailand at Bangkok Suvarnabhumi Airport and Duty Free Philippines. Says Ricola Head of Travel Retail and Middle East, Andreas Reckart: “The level of interest in the Swiss-design tins has been way beyond our expectations. We introduced them to capitalise on the ‘destination appeal’ but clearly retailers believe they have potential outside Switzerland.” With that in mind, Ricola will also introduce additional new travel themed tins in Cannes to gauge retailer reaction. To support its travel retail exclusive range – which also includes 125g doypack bags in three flavours, Original Herb, Lemon Mint and Eucalyptus- Ricola has developed a series of personalised merchandising units in the shape of a wrapped herb drop. These fun, eye catching units are already in place in Manila’s Fiesta Mall and at Mactan-Cebu International Airport with Duty Free Philippines where, says Reckart: “The units significantly increase the visibility of the Ricola portfolio instore and will – we are confident – help to build sales through both locations.” The unit can be seen in on Ricola’s stand in Cannes. Reckart says that Ricola’s main objective in Cannes this year is “to continue to establish our relevance in travel retail and build upon the success of the new travel retail exclusive products that were initially launched at last year’s show. We believe that we have something truly unique to offer in Travel Retail – a product that helps travellers address their voice and throat related problems throughout the journey.” The message seems to be getting through with new listings confirmed with Heinemann at Tel Aviv and Oslo airports, plus more under discussion. “We’re very much looking forward to continuing our travel retail journey in Cannes this year. It’s very much work in progress, but definitely going in the right direction,” says Reckart. 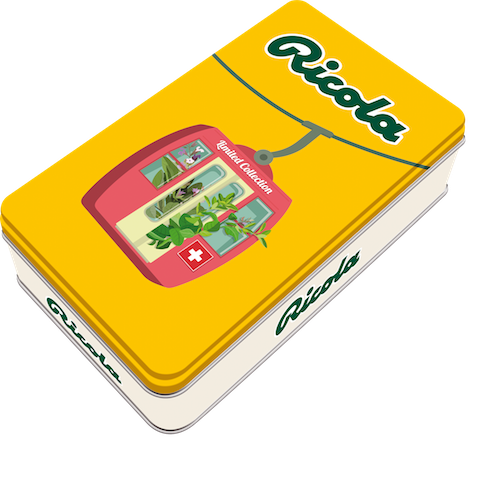 Ricola is globally known for its premium herb drops, based on a blend of 13 herbs cultivated in the Swiss mountains using environmentally friendly methods. Not only do Ricola products taste great, they also sooth the throat and freshen the breath and, in addition, the majority of the Ricola products are sugar free! Ricola also pays great attention to the quality of its other basic ingredients and uses no artificial colourings or flavourings. High-quality ingredients are a top priority for Ricola.